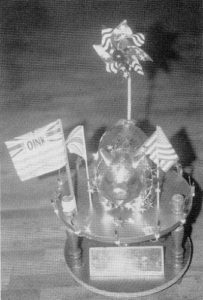 The Pig War (the orienteering version, not the original) was started in 1989. Cascade was organizing a national event (then called an “A” meet) on Orcas Island in the San Juan Islands. Its proximity to the site of the original Pig War (a dispute between Great Britain and the US over land ownership) inspired event directors Sandy Kish Miller and Katie Sprugel to create a modern-day orienteering-themed version of this infamous event. Initially a competition between COC and the Victorienteers of Vancouver Island, after a long ceasefire beginning in 1998, it re-emerged in 2016 as a skirmish between COC and GVOC (Greater Vancouver Orienteering Club). In 2019, the competition was escalated to include all of Canada and the USA. 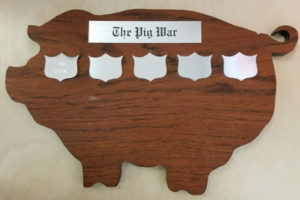 Scoring for the first Pig War was as follows: each participant earned 1 point for each day of competition. Extra points were awarded for the top 5 finishers on each course. The country with the most points at the end of the four days of competition was declared the winner. The scoring system changed over the years but, unfortunately, the details are lost. The gloriously hideous trophy, which was in later years enhanced with theme music, has also disappeared. All that remains is an old photo. 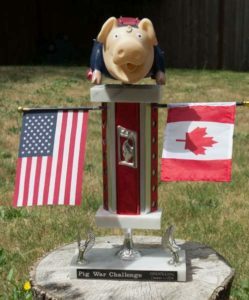 Anyone who knows the original pig trophy’s whereabouts is asked to please contact COC. No questions will be asked. Each course will have a set of age classes. Competitors will count for their country if they run their age class, or a harder one. Any competitor identifying as “Canadian” will count for Canada. The USA may challenge nationality if they believe the competitor is wearing insufficient plaid, or is not ending most sentences with “eh?”. Any competitor identifying as “American” will count for the USA. Canada may challenge nationality if the competitor is not wearing at least one American flag, or does not sing the national anthem before starting the course. Any challenges about a competitor’s chosen nationality/club will be ignored. The top 3 men and top 3 women in each class (with at least 1 competitor from each country) will score points. Top man/woman scores 3 points, second man/woman scores 2 points, third man/woman scores 1 point. All rules are subject to change at the whim of the organizers. The winner is the club with the most number of points (summed over all genders and classes).